When we first met Roxanna Elden during our workshop at the Miami Writers Institute, she said she had an idea for a teacher book. This made us skeptical at first — we’ve run publishing workshops for years, and in that time we’ve met hundreds of teachers who wanted to write books. Quickly, though, we realized Roxanna’s idea was different: a book that debunks Hollywood-movie teaching myths (see Hilary Swank, Edward James Olmos and Michelle Pfeiffer), and shares honest, funny stories and practical advice from teachers around the country. She described it as “Hard Liquor for the Teacher’s Soul.” Arielle and I were impressed, but we know writing doesn’t work like Hollywood either. Many talented writers give up before their work gets into the right hands. That’s why, along with quality writing, thorough research, and smart networking, our workshop emphasizes a fourth component: Persistence. Roxanna took this message to heart. See Me After Class: Advice for Teachers by Teachers was first published in 2009. Unfortunately, just as the book was beginning to gain national attention, the original publisher stopped printing its entire line of career books. Situations like these, as we mention in our book, The Essential Guide to Getting Your Book Published, can test even the most persistent of authors. But take heart, orphaned authors. The book caught the attention of Sourcebooks — one of our favorite publishers. A second edition of the book is out this month with an even better cover, a top-notch publisher, and an author with several years of experience promoting a published book. We are now checking in eight years since we first met Roxanna when she was a writer dreaming of being an author at our workshop. We asked her about teaching writing, writing about teaching, and getting a second shot at publishing success. The Book Doctors: Congratulations on the second edition, but let’s start at the beginning. When did you start writing your book and why? Roxanna Elden: My younger sister began teaching three years after I did, and during her first year, I started writing the book I needed during my first year — a funny, honest, practical collection of stories and tips from veteran teachers. There are so many books that share heartwarming teaching stories, but on a day when a second grader curses at you, you don’t want to read a heartwarming success story. You want to read a story about a kindergartener punching a teacher in the eye. You need to know that teachers can bounce back from their worst days and still go on to become successful. Then you need to know the next manageable step you can take to be a better teacher in the morning. TBD: What has changed for teachers since the first edition of your book came out? RE: New teachers today spend a ton of time comparing their unedited footage to other people’s highlight reels. They are also caught in the middle of political debates about education that have become much more public, polarized and angry. New teachers are usually not interested in getting caught up in politics, though. They just want to focus on getting kids to stop throwing wet toilet paper at the bathroom ceiling. TBD: What has changed in your life since you first became a published author? RE: I’m now a relatively experienced teacher, but I have recently become a rookie parent. It’s been a long time since I’ve been a beginner at something where the stakes are so high, and it kind of brings me back to that feeling of being a beginning teacher. TBD: How does being a new parent compare to being a new teacher? RE: Both teachers and parents need humor, honesty, and practical advice. The most important difference, however, is that there is that there are very few parents who quit within five year. Nearly half of all teachers do quit within five years. At low-income schools, half of all teachers leave within three years. Students at low-income schools are much more likely to have a rookie teacher at the front of the classroom. Any lessons new teachers learn the hard way, they learn full of a class full of kids. <em>See Me After Class</em> lets them know they are not alone. TBD: You have attended the Miami Writers Institute for many years. How did that community help you with the writing and selling of your book? RE: People travel from all over the country to attend the Writers Institute at Miami Dade College. I’m lucky enough to live ten minutes away. The Writer’s Institute has been like an express train, moving me to each new publishing milestone faster than I could have gotten there on my own. They offer workshops and opportunities that help with every part of the process. My first time attending was the year the Book Doctors were presenting. Your book and workshop gave me a map to follow that kept me from taking unnecessary detours. In later years, I attended workshops on structure and revision that helped make the book everything it could be. Four years into the process I met my agent, Rita Rosenkranz, at a workshop she was presenting on non-fiction book proposals at the conference. TBD: For many authors, finding an agent is one of the most difficult parts of the publishing process. What was the process like for you? RE: It was the longest part of the publishing process for me, and the most difficult, ego-wise. I spent many weekends eating pizza in my pajamas and reading “The Rejection Section” of your book. Then, each time, I would decide I’d put in too much work to quit, and start researching other agents. Most of my early queries led to one-line emails and rejection form letters. Then I started getting personal rejections with feedback. Later there were agents who showed interest at first and then said no after months of preparation on my part. This was frustrating, but their demands forced me to strengthen my platform — I launched a website, began performing standup comedy, and began finding public speaking opportunities. I also became a National Board Certified Teacher, which enhanced my credibility within the teaching profession. When I attended Rita Rosenkranz’s workshop about four years into the process, I immediately had the feeling that all of my experiences with other agents — even the frustrating ones — had prepared me so I would be ready when I met her. I handed her a business card and followed up by email the same day. Within a week we had a contract, and less than a month later she got a great contract with our first publisher. Later, when the book went out of print, she acted immediately to get the rights back and find a new home for the book at Sourcebooks, who has done an amazing job with the second edition. Without Rita’s help I would never have had the courage to switch publishers, and even if I did I can’t imagine I would have ended up with such a good one. TBD: What is different in your promotional plan this time around? RE: For this edition, I am starting with a much larger network of people who have read the book and are now happy to help promote it. The past four years have also provided a tremendous opportunity to connect with other writers and organizations that work with teachers, which has also helped in promotional efforts. Best of all, in the process of speaking to spread the word about the first edition, I’ve realized I love speaking to teachers and others interested in education. The past few years have brought many new offers for paid speaking opportunities, which has led to an unexpected side-career speaking on a variety of education-related topics. TBD: We usually hate to ask writers to give writing advice, but you teach writing at a high school — what advice do you give students based on your own experience as an author? RE: I usually don’t tell students that I’ve written a book until late in the year. Then I do a short unit on the publishing process and also try to relate it to other careers in which people advise you to “keep your day job:” music, acting, art, dancing, etc. I have a Xeroxed packet of my past rejection letters that I pass out early in the talk. Then I tell students the happier parts of the story. In the process, I try to reinforce the same four points your workshop emphasized four years ago, adapted for a high school audience: Put in the time to do it right, make an effort to meet people who can help you, and do your homework to see where you fit into your market. Most of all, be persistent: even if you hit roadblocks along the way, the story is not over until you say it is. But also keep your day job. Roxanna Elden is a National Board Certified high school teacher. 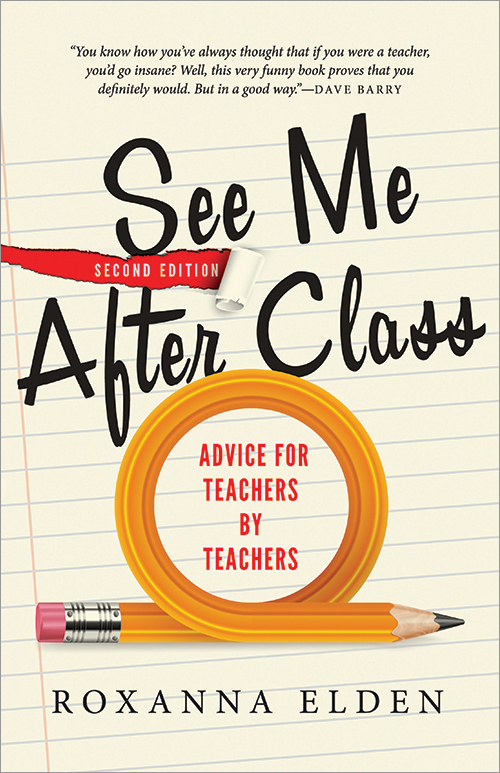 Her book, See Me After Class: Advice for Teachers by Teachers, is a funny, honest, practical guide with tips and stories from teachers around the country. Elden also speaks on a variety of education-related topics. For more information visit www.seemeafterclass.net.